2017 Our manifesto for full employment is almost ten years old! Ths manifesto written in common with our friends from the association "chômage et monnaie" can be found on this site at page www.neties.com/manifeste.html and on the site chômage et monnaie page http://www.chomage-et-monnaie.org/2008/01/manifeste-2008/ Still on the front ligne against flat earth economics and adversaries of both the people and the future including the ruling technocratic class and its obedient servants, the so called "Profession" of economists providing the ruling class the ideas it needs to proclaim the absolute necessity of its rule. -A recent trip to New York where I had very deep discussions with Tom Ferguson Director of Research of the Intitute for New Economic Thinking (INET) on the economic future of the USA after the election of Donald Trump and on the rise of populist parties coming from the nationalist right wing in France and in Europe. 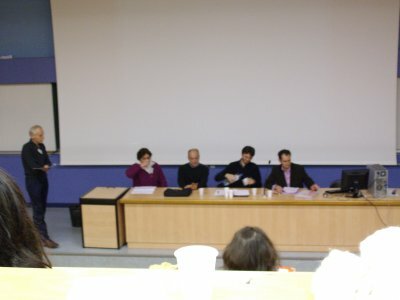 - A conference in London at the seminar of Victoria Chick at the faculty for oriental studies in which I addressed how a full theory of distribution is to be included in a general Circuitist Kaleckian model. 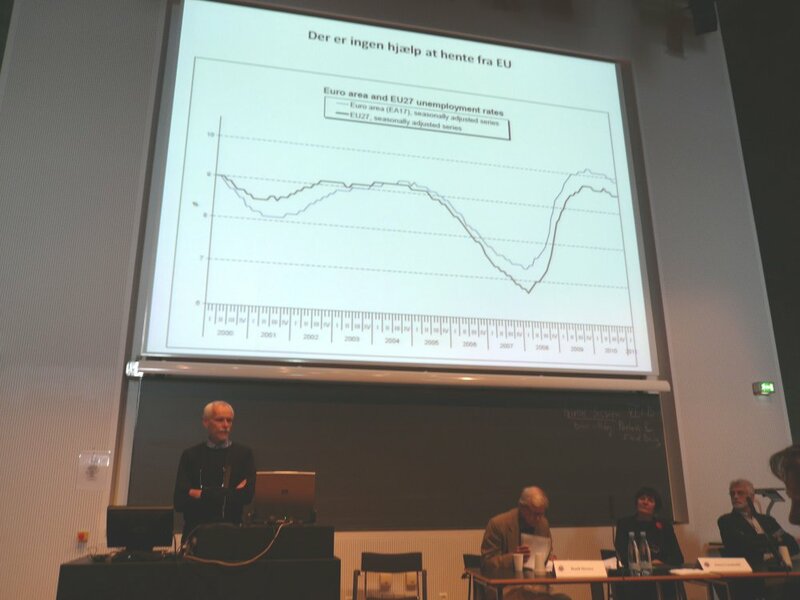 - A conference at the university of AAlborg-DK at the northern Post-Keynesian spring school invited by my friend Jesper Jespersen. 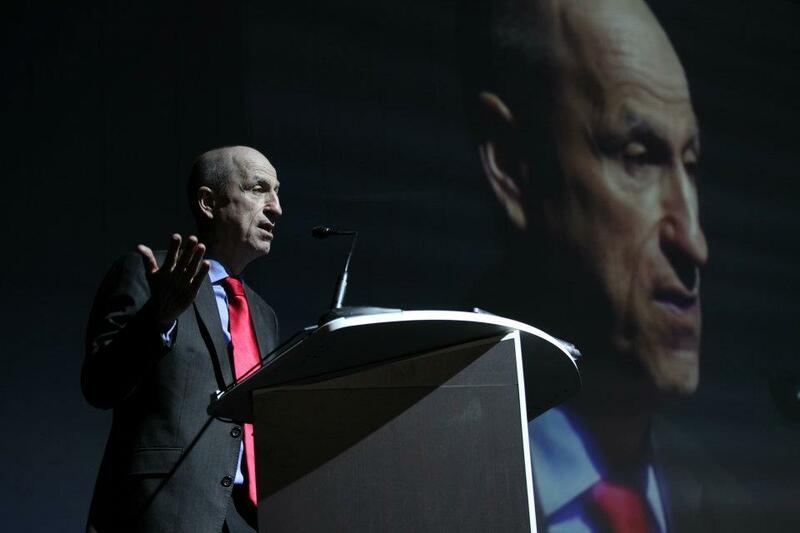 I addressed "No, we can't", a harsh dismantling of the austerity-to-death policies in the euro-zone. 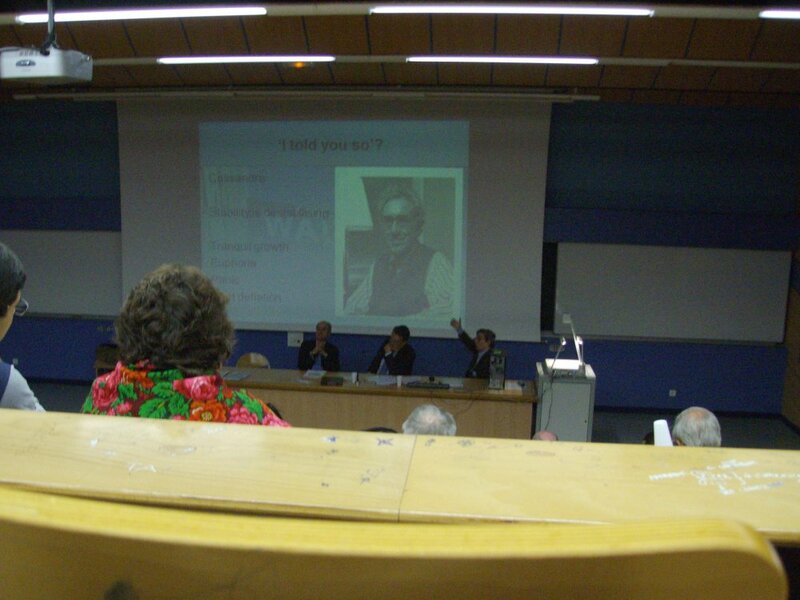 - Two interventions at the Grenoble Post-Keynesians summer-school, one on the core principles of the theory of monetary circuit, the other one in the round table on the future of the euro. - A conference in Poland, see below. Like Daniel Pichoud, I am horrified by the accelerated collapse of the financial real economy and society. France like all european countries is evolving towards what Peter Temin (2016) deems the unsustainable dual economy, On one side, there is the leading dominant sector Finance-High-Tech-Electronic Sector, on the other side there is the subordinate overwhelming sector of the economy and society. Duality instores a rigid apartheid between the two part of society. The FHTE sector controls economic and social policy and the State becomes its tool to enhance its rule. As I explain in my last research paper presented in Poland, such a total metamorphosis of capitalism leads to effective risc in unemployment, unsustainable inequalities in distribution of income, debasement of education and culture. In USA, the Trump regime is the outcome of such a catastrophe. It regenerates a very dark past since the impact of strong neo-nazi commitment is strong amid his closest advisers. In Europe, governments are blind to the disaster. They applaud the Greek Prime Minister who destroys his country to pay the State debt. It is a perfect exemple of the obscure faith into the euro new order of which the core principle is to demonetise the State by preventing ab initio the State creation of money. Are governments and their experts that ignorant of the law of macro-economics? Today, my answer is straighforawed : illimited austerity was and is still the ultimate ratio of the Euro as I prove in my study (IJPE). The father of the Euro, François Perroux, was a dedicated nazi philosopher for whom austerity was part of racism as the sine qua non of creating a strong, brutal, new people! 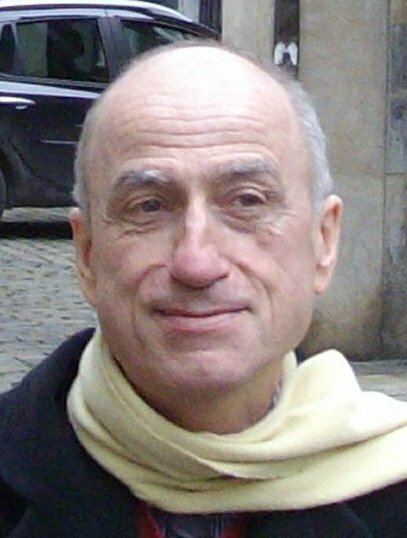 In the course of years, nothing changed, Perroux and his followers shaped the so-called "French Plan" aiming at a permanent austerity. What is a pure drama : in the course of time the very spirit of resistance vanished with the debasement of culture and education. In USA, there could be hope under the Obama administration when Janet Yellen replaced as chair of the Federal Reserve Board Ben Bernanke the ultra-conservative "Albeit new-Keynesian (which means nothing) aimed at minimizig the rate of unemployment (official measure) by accelarating the acquisition of federal bonds held by banks. Whatever the dubious success of those policies only targeting banks one must wonder what could be the Trump administration political economy. As far as we know, Trump's agenda is to restore some kind of State monopoly capitalism like in the XXth century golden age. It would be a cornucopia for financial trusts and big corporations, with the promise of quasi 0 taxes and abolition of all protection of environment! In any case, I strive to enlarge my prespective as shown by my Post-Marxist last essay thanks to discussions with high-minded friends in Mexico, Italy, France indeed. Herein are the sole solutions. My friend Daniel Pichoud believes that the Euro could be saved by a sovereign decision of the European Council. For me, it is fully impossible.The ruling technocrats at all levels want permanent harsch austerity like the early fathers of the order. I am now working hard of what could be a useful social protectionism against multinationals like Monsanto. I am also thinking anew on the question of exchange-rates. With some delays, the outcome of some health problems here is what I did or strived to do in the past year and the early new year. 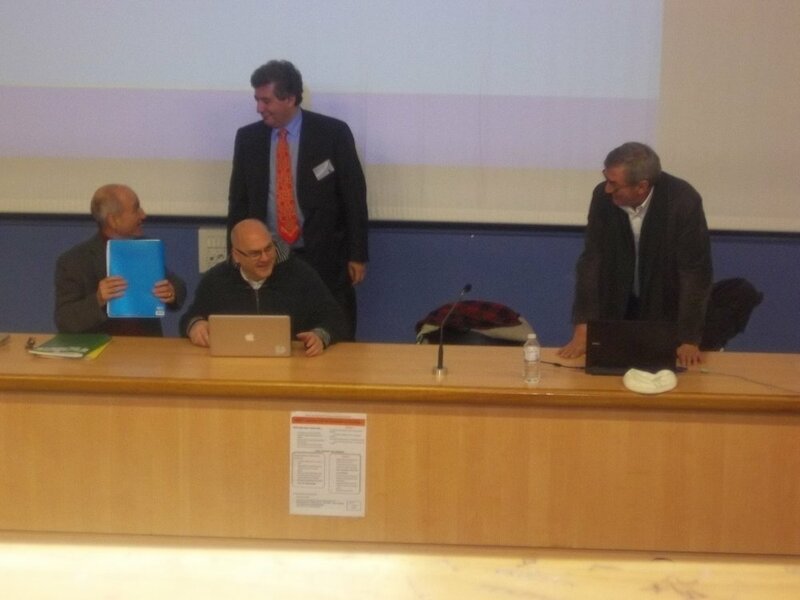 -Two conferences in Bergamo Italy presenting the core of the general theory of the monetary circuit and at the invitation of MMT (Modern Money Theory) with my friend Warren Mosler. 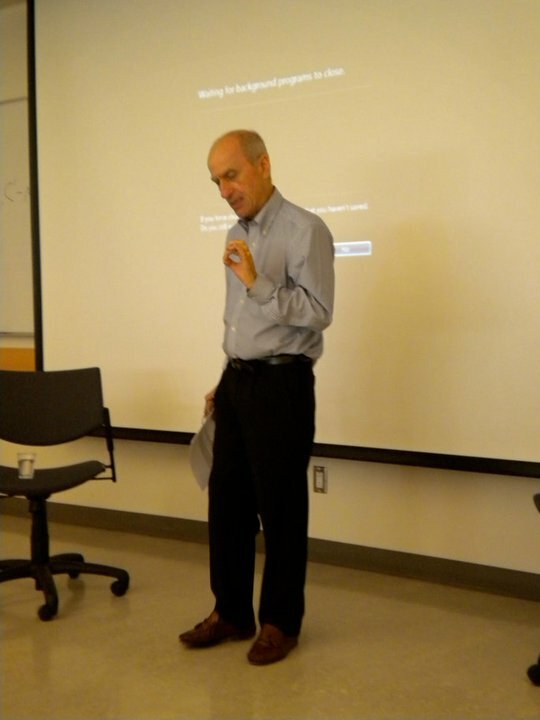 -A presentation of the book in my honour in Ottawa followed by the delivery of a paper at the Eastern Economic Association conference in Boston: A critique of flat earth economics: Potential output and structural deficits. -Three books, the first in English a collection of paper of Post-Keynesian economists: Monetary Economies of Production: Banking and Financial Circuits and the Role of the State: Essays in Honour of Alain Parguez. Co-edited by Louis-Philippe Rochon and Mario Seccarecia. Cheltenham: Edward Elgar. A paper with my friend and colleague Slim Thabet for the International Journal of Political Economy special issue on “Keynes today” : The XXIst century world crisis : a Keynes moment IJPE vol 42 pp26-39. A paper soon to be published in the Review of Keynesian Economics: A modern capitalist economy without deflation. With Daniel Pichoud we are horrified by the collapse of the French real economy. Discussions with Daniel Pichoud and with my friend Riccardo Bellofiore convinced me that the problem of the Eurozone is not the Euro but the way the governments use it to give legitimacy to their predatory ideology. In the USA at the end of a 2013 monetary committee (FOMC), the Federal Reserve has indicated that it will reduce from 85 down to 75 billions dollars (from 63 down to 56 billions euros) the monthly purchase of assets that is made to support economic activity. Beginning in january 2014 the bank will purchase 40 billions $ in treasury bonds instead of 45 previously and 35 billions $ of mortgage backed securities instead of 40 previously (when In Europe the ECB cannot buy directly treasury bonds from the member States and thus cannot master their interest rate). It was the last decision of Ben Bernanke, a "New Keynesian" with a somewhat high target of unemployment (6,5%), Janet Yellen who succeeded him aims at less than 6% unemployment (she is a Keynesian deficit dove) and money creation will continue. With Daniel Pichoud we are owls (Keynesian deficit owls) thinking that it is feasible to aim at a long-run target of 0% rate of unemployment (not including of course those who lrft a job for anther job they are sure to obtain) before stopping to rise the public debt of the States to avoid triggering inflation. In Europe, alas, most economists will continue to state that this money creation about half for the State an half for the rest of he economy is unsustainable and will have no impact on job creation. They simply ignore the fact that in the USA the budget deficits of 10% of GDP accepted during the two first years of the Obama presidency brought unemployment down from 10% in 2009 to 7.6% in 2013. As for myself I will continue to « enlarge » the Theory of the Monetary Circuit and economics emphasizing the leading role of the State as an existence condition of the circuit itself. Studies like the wonderful book “The entrepreneurial State” of Dr Mariana Mazzucato support this core proposition which rejects all exogenous limits to “public deficits” and public debt as long as they reflect State investments building the best possible future and as long as the State never get indebted to private banks. It must be supported by a theory of exchange rates, I am working on, proving that on one side floating exchange rates are required, on the other side that the tragedy of the Euro is that it is grossly overvalued by speculation. YEAR 2012 At the end of this year 2012 in spite of all our efforts it is always as difficult for people to understand how a modern money works and that a good practice of money could be a solution to the euro crisis. My friend Daniel Pichoud still believes that there is still hope to save the Euro by a sovereign decision of the european council (see his paper on Modern Money Good practice). As for myself I consider that there is now only one solution: to leave the Euro to denounce the whole "iron-heel" of the fiscal pacts. 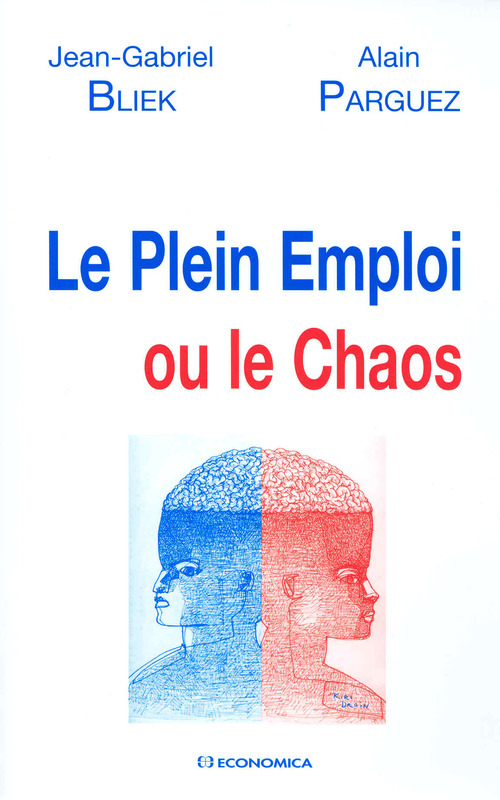 See the summary of my 2012 works and the video featuring the main points of my intervention at the International Post-Keynesian Conference of Dijon in december. Milano May 12-13 with my colleague and Friend Riccardo Bellofiore of the Universty of Bergamo I participated in a seminar on MMT (Modern Money Theory) February 24-26 I was invited to speak at The Italian Modern Money Theory (MMT) summit in Rimini organised by Paolo Barnard. Before an audience of more than 2000 participants Michael Hudson, Stephanie Kelton, Marshall Auerback, William Black and myself explained why there is an alternative to the European governments austerity policies. See the Video report: http://www.youtube.com/watch?v=XP60tpwu5cs Read the paper of Michael Hudson summing up the meeting. http://michael-hudson.com/2012/02/mmt-theory-as-an-ecb-alternative/ YEAR 2011 2011 Nov 3-4 Workshop organized by the EU Center of Excellence at the LBJ School of Public Affairs University of Texas at Austin Alain Parguez Emeritus Professor of Economics, University of Franche-Comté, Besançon-France Solution proposed to get out of the crisis. "By decree of the European council wealthiest States whose debt is still rather well rated, create a pool , a special fund managed by the European Investment Bank (EIB), issuing euro-bonds sold to the ECB, technically to the respective central banks at zero or quasi zero rates. Proceeds from euro creation by the ECB will be borrowed at quasi zero rates by Greece, Spain , etc... which could cancel enough share of their debt to reverse private banks expectations. The success depends on three conditions. First condition : No more destruction plans imposed on Greece. All existing destruction plans should be stopped. Second condition : Proceeds of this acquisition of euro bonds should not be included into public debt, borrowing should be purely conventional. Third condition : what about the future? The technique is to fail if it only deals with past never to be reimbursed debt. It must free the future, allowing all member States to change the course of their policy and play again their anchor role. It means that the principle of privatisation of public finance should be jettisoned. Euro bonds must be issued by all member States to allow the reconstruction of the Euro-zone economy and society by public investments bypassing the still frightened private banks. The counterpart of these bonds is the accelerated growth of the stock of public capital including of course its crucial component; human capital. Proceeds will be transferred to all member States and especially to poorest States to reconstruct their real economy devastated by addiction to punitive austerity imposed by France and Germany alike. " “Could this solution be accepted? I have to express my strong doubts since it violates the hidden supreme purpose of the "Union". Instead of an hyper-capitalist system which is dying it could achieve a new mode of production what could be deemed social-capitalism. How could this evolution be accepted by Germany and especially by France which are more than ever starting the race to "Austerity" or "Rigor Mortis"? No shrewd financial innovations can save what cannot be saved because it does not want to be saved. The dismantling of the State, its privatisation shared by the whole EU rulers is the true cornerstone of the Union. What would banks do with the money created to save them, invest it in private assets never issued for real value generating expenditures. Henceforth, while destroying the real base of the economy and depriving public bonds of any real value, forced "reimbursement" of the debts will generate a new wave of hyper-speculation and capital gains plus dividends to former productive corporations motivating them to abandon without remorse the real economy! As for wished reimbursement before terms decreed by Germany and France for their own debt one can only cry before such a folly of the ruling elite!!! ****************** August 2011 the "crisis" is back in Europe and elsewhere. A way out for Europe seems feasible to Daniel Pichoud and myself and we have drafted a document exposing our analysis and proposals. The french version of the document is here. From this document Daniel Pichoud wrote a scenario for coming out of the Euro crisis. The french version of the scenario is here. **************** Ottawa May 31-June 1 2011: Conference organized by Louis-Philippe Rochon and Mario Seccareccia held at the University of Ottawa "Contemporary Capitalism; its financial circuits, its transformation and future prospects". My Keynote presentation: The true meaning of the General Theory of the Monetary Circuit: Discovering the objective laws of the capitalist system to attain full employment and welfare while fighting against its self-destroying tendencies. On the theme of the new "New Deal of President Obama this conference which was a complete success, has been very enlightening on the differences in economic policy between the USA and Europe. ****************************************** YEAR 2008 July 14-18 El Escorial paper presented at the summer school of the "Universidad Complutense de Madrid" "How France and the Euro countries can survive the European model of permanent deflation" "Comment la France et les pays de l'Euro peuvent survivre au modèle Européen de déflation permanente" Janvier 2008 Avec Daniel Pichoud et l'association chômage et monnaie nous avons rédigé un manifeste pour le plein emploi et nous consacrons actuellement à une diffusion la plus large possible de ce manifeste. ************************************** YEAR 2007 November 30 Presented at the Third International Post-Keynesian conference of Dijon "Principles of Post-Keynesian economic policies" The conference has gathered the reprentatives of 16 countries at 'Université de Bourgogne (Laboratoire d'économie et de gestion). Money creation, employment and economic stability: The monetary theory of unemployment and inflation or why there cannot be a trade-off between employment and inflation : targeting true full employment is the golden path to genuine true stability ****** Written in Austin (Texas) January 2007 How real is the real rate of interest ************************************************ YEAR 2006 International Conference on growth models Quel modèle de croissance pour la France? 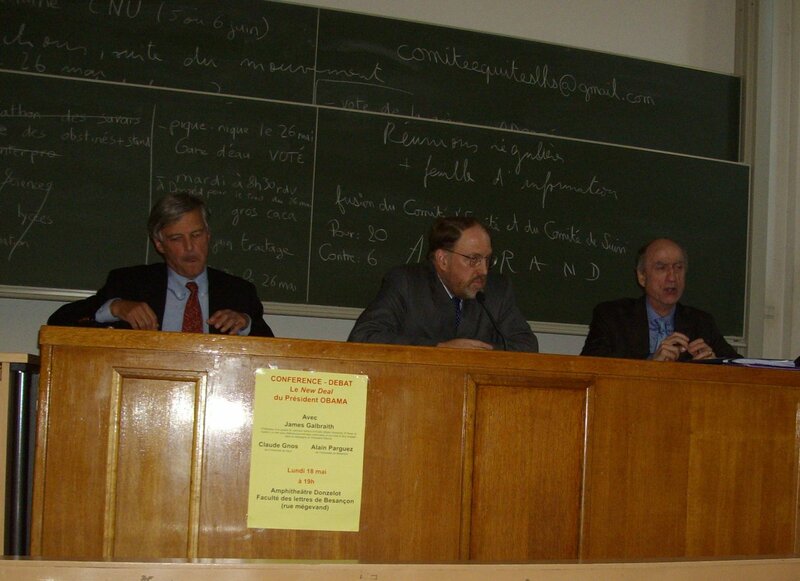 Le 30 Juin 2006 au Sénat s'est tenue une Conférence internationale à l'invitation de : Pierre-Yves Collombat Sénateur du Var Alain Parguez Professeur Université de Franche-Comté James Galbraith Professeur University of Texas More-En savoir plus(page in french) NEW BOOK Le plein-emploi ou le chaos Philadelphia Feb 24-26 Eastern Economic Association Conference © Olivier Giovannoni, Alain Parguez : The empirical importance of consumption, Theory and Policy implications © Alain Parguez : Creation of money for the State is endogeneous ************************************************ YEAR 2005 New York March 4-6 Eastern Economic Association Conference © Olivier Giovannoni, Alain Parguez : What Drives Profits ? © Alain Parguez : An inquiry into a genuine history of money Sept 2005 new and final draft © Olivier Giovannoni, Alain Parguez : What Drives Profits ? 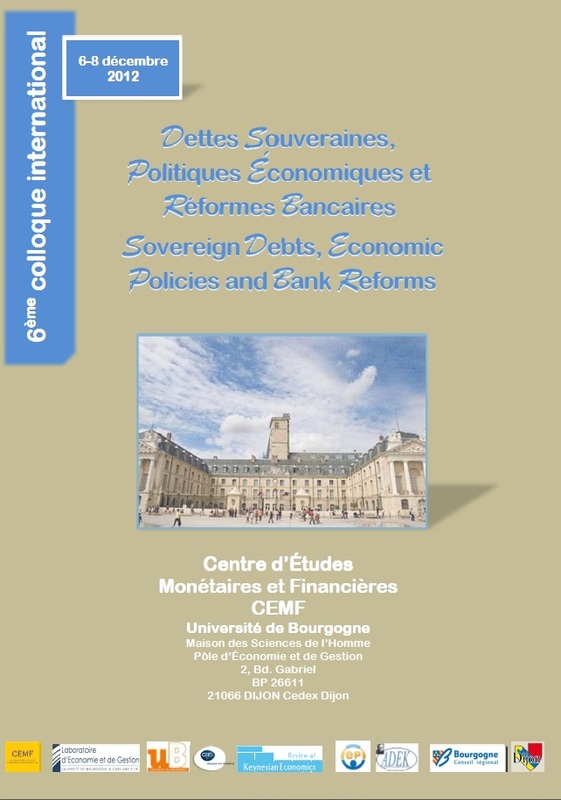 Presentation for the International Conference organised by the « Centre d’Etudes Monetaires et Financieres » University of Bourgogne at Dijon on The Political Economy of Governance. Dijon December 2-3 2005 © Alain Parguez : How Good is Good Governance or the Temptation of Economists ****************************************************** YEAR 2004 March 2004 Three short pieces On the state of economic theory or What is the true message of hope for young committed economists? May 2004 The Three short pieces are now four June 2004 A note on Oil June 27 2004 at UMKC "A Genuine full employment policy"